Three Palestinian fighters were injured late on Saturday night by Israeli shelling after reportedly hurling an explosive device at Israeli special forces who entered the Gaza Strip east of Al-Maghazi Refugee Camp. According to An-Nasser Salah Addin Brigades, the military wing of the Popular Resistance Committees, Israeli soldiers were also injured in the event. 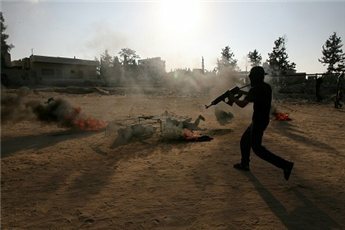 The Brigades said their attack came in retaliation for "ongoing Israeli aggression" in the Gaza Strip and the West Bank, An-Nasser Brigades said in a statement which also affirmed that "Jihad" is the best tool for liberating the Palestinian lands. At mid day a homemade projectile landed in an open area in the Israeli border town of Sderot, causing no damage. No Palestinian group has yet claimed responsibility for the attack. Israeli Defense Minister Ehud Barak decided again to keep the border crossings between Israel and the Gaza Strip closed in reaction to continued shelling of Israeli targets. Israel has maintained a near total closure of the Gaza Strip since 4 November, the same day it invaded the coastal territory, touching off more than three weeks of violence that have threatened a five-month old truce agreement. The Al-Qassam Brigades launched five homemade projectiles at Israeli targets, and the Al-Mujahidin Brigades another two following the death of one activist by Israeli shells north east of Khan Younis Friday afternoon. One man was reported dead and several others injured after Israeli warplanes launched three rounds of shells at An-Nasser Brigades activists, from the military wing of the Popular Resistance Committees (PRC), in the town of Al-Qarara. Director of Ambulances and Emergency at the Ministry of Health Dr Mu'awiya Hassanein said three men were transported to the Nasser Hospital in Khan Younis. He also confirmed three loud explosions were heard in the region, and said ambulances were unable to reach the remote area where the shells hit immediately. Hassanein indicated medical staff had heard reports of one man killed and several others injured. The Al-Qassam Brigades, the military wing of Hamas, announced that the projectiles were in response to the Israeli shelling of Al-Qarara. The Al-Mujahidin Brigades, affiliated with Fatah, sent a statement on Friday evening claiming they sent two homemade projectiles at an unspecified Israeli military target in the Al-Farahin neighborhood east of Khan Younis. Israeli sources have not reported any injuries. A Palestinian teenager was injured in clashes with Israeli troops north of Jerusalem at Qalandiya Refugee Camp on Wednesday. The 17-year-old, Khair Allah Adib Al-Jamal of the Bet Suriq village was seriously injured in the clashes, medical sources reported. 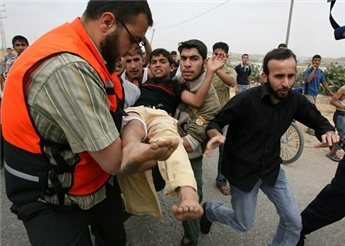 The boy was taken to a government hospital in Ramallah, where doctors called his condition serious. A spokesperson for the Israeli military said that he had thrown a molotov cocktail at Israeli troops and that soldiers had fired toward him in response. The Israeli army has been assassinating wanted West Bank Palestinians in spite of the High Court of Justice's guidelines, according to operational briefings obtained by Israeli newspaper Ha'aretz and published on Wednesday. High-level military officials approved assassinations in the West Bank, "even when it could have been possible to arrest the targets instead," according to the Ha'aretz report. Army officers authorized the killings in advance, "in writing, even if innocent bystanders would be killed as well," the report goes on to say. The assassinations policy also runs contrary to what the military had been telling the High Court, "as they were subject only to minimal restrictions" prior to a court ruling that demanded otherwise. 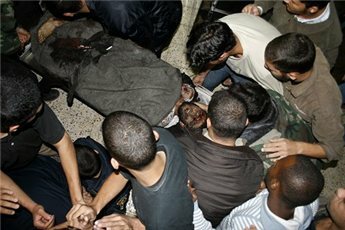 Ziad Malaisha, who was killed on 20 June 2007 near Jenin was published in the Israeli newspaper as an example of one such mission. The obtained document, which is a preliminary paper called "Operation Two Towers," details a mission planned by Israeli commander Yair Naveh. Though it insists that "the mission is arest," the document allows for the army to kill any of three Islamic Jihad members. On 12 April, the same commander approved the killing of just one of the three, as well as "another two people at most." According to a spokesperson for the Israeli army's office, the plans to kill Islamic Jihad members would only be implemented if arrests failed, but that the "alternative is preferable." A Palestinian fighter died on Monday of wounds he sustained in an Israeli raid in Gaza on 15 November, medical sources said. Fawzi Hamad an activist in the An-Nasser Salah Ad-Din Brigades, the armed wing of the Popular Resistance Committees, died early on Monday. Meanwhile, medical sources said on Monday that Israeli forces shot a Palestinian civilian in the leg near the northern border of the Gaza Strip. The man said he was hunting birds in the Abu Safiyah when he was shot. A former governor of Jerusalem died of an apparent heart attack as his ambulance was delayed at an Israeli checkpoint en route to a hospital, relatives told Ma'an on Sunday. The 63-year-old former Jerusalem governor, Jamil Othman Nasser, died Saturday evening after Israeli soldiers at the Az-Zaitouna checkpoint refused his ambulance, which was en route to Al-Maqassid Hospital. The ambulance driver alternatively drove him to Abu Dis University Hospital, but he was pronounced dead on arrival by medical officials receiving him, relatives confirmed. He will be laid to rest on Monday at the Al-Eizariya Cemetery. Nasser was the first governor of Jerusalem since the establishment of the Palestinian National Authority 14 years ago. 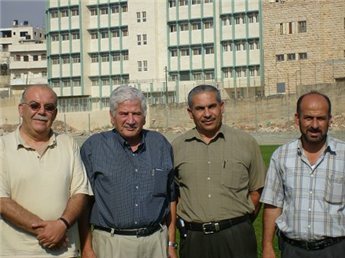 He was a member of the National Council and head of the Agricultural Society in Jericho, as well as an influential member of the Palestine Liberation Organization. Two Palestinians were injured by a surface-to-surface missile fired from an Israeli artillery base on Saturday night, according to a Gaza hospital official. The two Palestinians were believed to be militants preparing to launch an attack on Israel, though no side claimed responsibility for the men's actions leading up to the Israeli assault. The men, who were apparently only lightly injured, were taken to Beit Hanoun Hospital in Gaza, where Dr. Mua'waiyah Hassanein announced their conditions. Hassanein is the director of Emergency and Ambulance Services in the de facto Health Ministry. Meanwhile, Israeli security sources said militants fired three projectiles toward Israeli towns near Gaza on Saturday night. Sources added that the attacks "were breaches of the truce," though the projectiles did not cause any injuries or damage. The reported projectiles landed in Sderot and Ashkelon, Israel on Saturday night, according to security sources. A fighter affiliated with the Al-Qassam Brigades, the militant wing of Hamas, was killed early on Thursday in Gaza City by the shrapnel of a missile fired from an Israeli tank. Mu'awiya Hassanein, the head of Ambulance and Emergency Services in the Palestinian Health Ministry, told Ma'an that 21-year-old Mohammad Abd Ash-Shaqour Al-Ara'ir died when an Israeli tank fired a missile toward him. The tank was operating near the Nahal Oz border crossing east of Gaza City. Al-Ara'ir was transferred to Ash-Shifa Hospital, where he died. No other injuries were immediately reported. 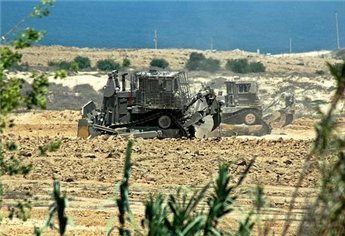 Israeli tanks and bulldozers invaded the southern end of the Gaza Strip, near the city of Rafah at 9am on Tuesday and began razing agricultural lands. Three tanks and two bulldozers breached the Gaza border and went 50-100 meters into the An-Nahdah neighborhood east of Rafah, just meters away from the ruins of Gaza International Airport. Bulldozers remained in the area at press time. The Al-Qassam Brigades, Hamas' military branch, reported launching a projectile at the military vehicles as they rolled across the border. Separately, the military wing of the Popular Front for the Liberation of Palestine (PFLP), the Abu Ali Mustafa Brigades , said it spotted, then exchanged fire with undercover Israeli forces at the northern end of the Gaza Strip, in the Al-Bura neighborhood of Beit Hanoun. The Abu Ali Mustafa Brigades urged all armed factions in Gaza to reconsider the five-month old ceasefire in light of the Israeli attacks. Early Tuesday morning Israeli officials announced that Gaza crossings would remain closed and cited the continuation of projectile launches from Gaza at Israeli targets as the reason for the closure according to Israel Radio. On Monday Karem Shalom crossing was opened to allow a token amount of aid into the Strip, which UN officials estimated would last "a few days." The border officials are not allowing any fuel or journalists into the area, creating both a media and general electricity blackout over most of the Strip. Monday also saw the launch of four homemade projectiles by Palestinian military groups. No casualties have been reported. Israeli military sources asserted that crossing points would remain closed as long as shells from Gaza continue to land in Israeli areas. The international community has condemned the Israeli decision to close-down the Gaza Strip, and the move has been called an egregious example of collective punishment.